Erik Jones pushed Martin Truex Jr. to the lead on the race's penultimate restart. 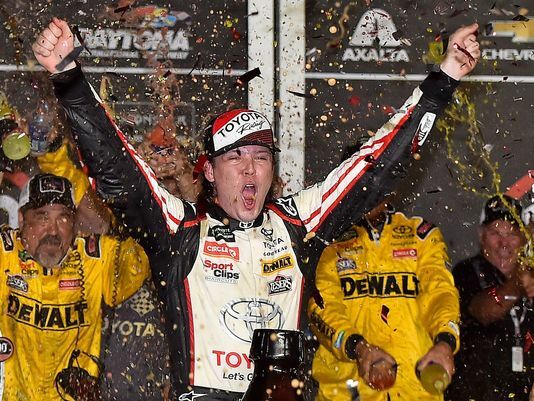 He led the pack from Truex after the race's last restart and pulled away to win his first profession Cup Series race Saturday night at Daytona. Jones, Truex and others were survivors of a genuine race of whittling down. Four monstrous wrecks damaged the race and only 13 of the 40 cars that began the race completed on the lead lap. For hell's sake, Jones' car barely survived. His car had genuine harm on the correct back. One of the enormous wrecks in the race came to set up Jones' go of Truex. The 2017 champion was clear of the field making a beeline for the white banner when Clint Bowyer's car got guided into the divider. That set off a multi-pile up and caused another extra time wrap up. Jones had driven Truex to that lead on the restart a lap before the crash. Bowyer couldn't get snared with race pioneer Kevin Harvick — who had a beat-up auto himself — and Jones pushed Truex clear of the two Fords within line. Jones at that point restarted close by Truex on the race's last restart. Kasey Kahne made a challenging move for the lead on turns 1 and 2 after the restart yet Jones got a push from Chris Buescher down the backstretch and whipped around Kahne and Truex for the win. Jones is in his second season in the Cup Series and his first with Joe Gibbs Racing. He moved to Cup up from JGR's Xfinity Series group in 2016 and sent the 2017 season as a colleague to Truex. JGR at that point supplanted Matt Kenseth with Jones in the No. 20 auto for 2018. The triumph implies Jones is the seventh diverse champ in 18 races in 2018 and the seventh distinctive driver to bolt up a playoff compartment. Jones was most likely safe on focuses to make the playoffs had he not gotten a win, but rather he currently doesn't need to stress over that. Jones' win came after the second extra minutes endeavor. The main endeavor finished with Bowyer's crash and was set up by a four-auto wreck on lap 155. That disaster area including Michael McDowell, Aric Almirola, Jimmie Johnson and Joey Gase was the seventh wreck or turn of the night. The greatest crash of the night occurred amidst arrange 2 on lap 54 when Brad Keselowski got killed the guard of Ricky Stenhouse Jr. at the point when Keselowski went to pass William Byron for the lead.